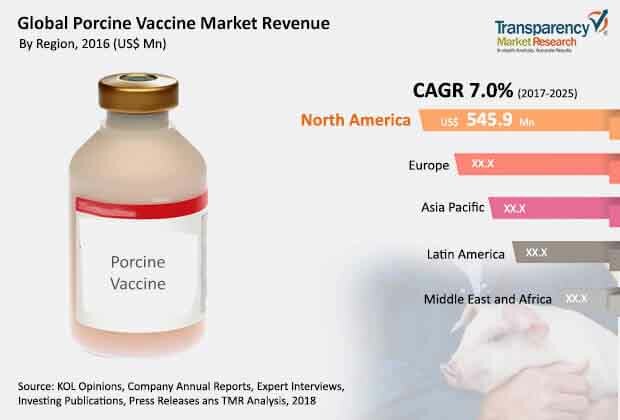 The global porcine vaccines market was valued at US$ 1,784.0 Mn in 2016 and is projected to expand at a compounded annual growth rate (CAGR) of 7.0% from 2017 to 2025, according to a new report published by Transparency Market Research (TMR) titled “Porcine Vaccines Market: Global Industry Analysis, Size, Share, Growth, Trends, and Forecast, 2017–2025.” The report suggests that increase in the number of hog/swine farms and rise in the demand for porcine meat and gelatin are expected to drive the global porcine vaccines market from 2017 to 2025. North America and Europe are projected to dominate the global market during the forecast period, owing to increase in the demand for swine meat and high adoption of porcine vaccines for instant treatment planning by veterinary doctors as well as researchers. The market in Asia Pacific is projected to expand at a rapid CAGR during the forecast period. Growth of the market in Asia Pacific can be attributed to large volume of pig cultivation in countries of Southeast Asia, rising population of pigs requiring treatment for various diseases such as diarrhea and swine influenza, and growth of biotechnology firms producing swine vaccines in the region. The market for porcine vaccines in Latin America is likely to expand at a moderate growth rate during the forecast period. The global porcine vaccines market is projected to be driven by value-added features offered by various animal health care companies in order to streamline the day-to-day workflow and increase the revenue. Porcine vaccines provide a wide range of benefits for the treatment of swine diseases. Key players offering porcine vaccines are coming up with vaccines with value-added features such as effective recombinant vaccines, DNA vaccines, and conjugate vaccines. These new features or technological advancements in vaccines reduce the overall vaccination cost and thus, improve the overall effectiveness and efficiency of swine production practices. Companies are focusing on the development of vaccines for major diseases such as African swine flu and porcine circovirus associated disease (PCVAD). Other factors such as growth of biotechnology companies engaged in research and development of porcine vaccines, rise in investments in R&D, and growing government initiatives for funding societies for growth of the agriculture field are fueling the global porcine vaccines market. Among technologies, the inactivated vaccines segment is anticipated to hold a prominent market share by 2025. The segment is projected to witness growth during the forecast period, due to easy availability, low risk of revert reaction of killed viruses among swine, low cost, and new innovations by key players. The live attenuated vaccines segment is estimated to hold a major market share by the end of 2017, due to increase in broader cross-protective immunity. The segment is likely to be driven by increase in the occurrence of new virus strains of PCVAD or PRRSV and chances of reverse reaction of vaccination, which can infect healthy swine and can spread to the herd. Live attenuated vaccines facilitate outcomes in the treatment of classical swine fever (CSF). Increase in major losses in pig farming due to CSF is likely to fuel the segment during the forecast period. The report offers detailed segmentation of the global porcine vaccines market, by disease indication. Based on disease indication, the market has been segmented into diarrhea, swine influenza, arthritis, Bordetella rhinitis, porcine reproductive and respiratory syndrome (PRRS), porcine circovirus associated disease (PCVAD), and others (CHRS, leptospirosis, etc.). Diarrhea and porcine circovirus associated disease (PCVAD) segments are poised to account for a significant share of the market during the forecast period. Factors responsible for higher share held by diarrhea and porcine circovirus associated disease (PCVAD) segments include rising incidence of climatic changes, overfeeding of protein diet, and ingestion of microscopic parasites along with food. Various funding and awareness programs by government and private animal health care organizations for treating swine diseases have resulted in significant shares held by diarrhea and porcine circovirus associated disease (PCVAD) segments in the global market. Among end-users, the hog production farms segment accounted for a leading share of the global porcine vaccines market in 2016 and is estimated to gain market share by 2025. It is projected to expand at a CAGR of more than 7% during the forecast period. Expansion of specialized pig production units in major countries worldwide and increasing demand for pork meat and byproducts such as gelatin have led to prominent share held by the hog production farms segment in the global porcine vaccines market. Increasing pork trading and growing number of pig slaughterhouses with the rising demand for pork meat are likely to drive the hog production farms segment during the forecast period. High prevalence and incidence rates of swine diseases in farms have resulted in increased visits by farmers to veterinary hospitals. These factors are expected to fuel the veterinary hospitals segment between 2017 and 2025. North America and Europe accounted for a significant share of the global porcine vaccines market in 2016 and are likely to gain market share by 2025. High consumption of pork meat and high production of swine have contributed to leading share held by these regions in the global porcine vaccines market. Asia Pacific is projected to be the most attractive market for porcine vaccines by 2025, with the highest attractiveness index. The market in Asia Pacific is projected to expand at a high CAGR of nearly 8% during the forecast period, due to increasing trading of pork meat in developing countries such as India and China. Rising number of production units for hog/swine and high consumption of pork meat in countries such as Japan, Australia, New Zealand, Malaysia, Singapore, and Taiwan are likely to fuel the Asia Pacific porcine vaccines market from 2017 to 2025. The market in Latin America is poised to expand at a moderate growth rate during the forecast period, due to increasing production of pigs in Argentina and increased government funding for R&D in Brazil. The report also provides profiles of leading players operating in the global porcine vaccines market. Boehringer Ingelheim GmbH, Ceva Santé Animale, Elanco (Eli Lilly and Company), Merck & Co., Inc., and Zoetis, Inc. are some of the leading players operating in the market, which account for a significant market share. Companies operating in the market are aiming to enhance their geographical presence through strategic acquisitions and collaborations with leading players in the respective domain and geography. In January 2015, Elanco (Eli Lilly) completed the acquisition of Novartis Animal Health (Novartis AH) for US$ 5.28 Bn. The acquisition has provided Elanco with greater commercial presence in the companion animals & swine sector. Other prominent players operating in the global porcine vaccines market are Bimeda Animal Health, Vetoquinol, and Bayer AG.